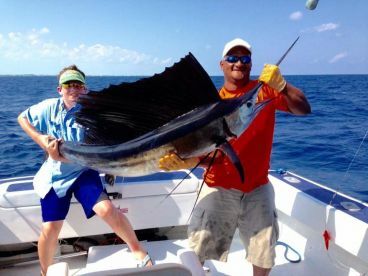 Freedom Tours - Fishing Unlimited is run by Captain Gilbert (Hilly Boo) Lara, a local fisherman who was born and raised on La Isla Bonita, Ambergris Caye. 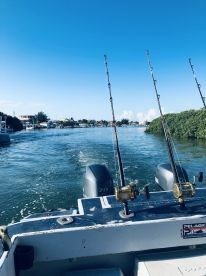 He has been offering guided tours in the area for nearly thirty years, steadily growing his fleet of boats that he has built and designed himself specifically for charter fishing trips in the local area. 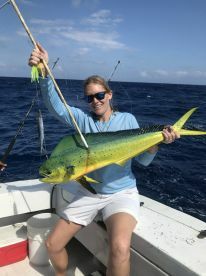 All trips with Freedom Tours are held by experienced local captains, who will show you the best of what the area has to offer, whether you want to try deep sea, reef, or flats fishing. This trip did not disappoint, within the first 20 minutes of being on the water we caught a really nice barracuda followed by tuna and overal we ended up with 3 very large barracuda and nine tuna. 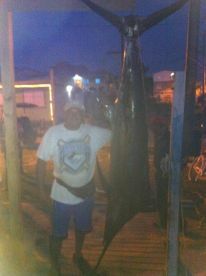 To end the day I hooked on to a blue marlin but after a 25 minute fight the line got cut. Overall a great experience and highly recommend this trip. Plus they came and cooked the fish for us at our suite afterwards and was delicious!! The boat arrived at our dock exactly at 8:00am as promised. This type of precision started the trip on a positive note. Seas were high and the ride a bit rough at times but Captain Richard handled the boat competently and safely. The mate Byron was fabulous in technique and attentiveness. Truly top notch. I could not have asked for a better, more coordinated crew. I am glad you had a great time if you give me your email address i can email them to you. Hi I am glad you had a great time if you give me your email address i can email them to you. Two awesome days with Freedom Tours! 1:15 to 2:05 is Freedom Tours pics & action. Thanks guys!!!! Outstanding time with Capn’ Frank & Effrin! 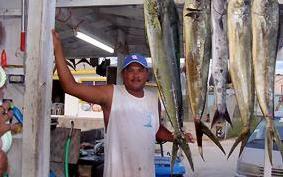 Caught 6-7 fish out deep first day, many more & lobster & awesome remote island meal the second day. Short vaca video is here: https://www.youtube.com/watch?v=_6wl030aRls 1:15 to 2:05 is Freedom Tours pics & action. Thanks guys!!!! My husband and I had a wonderful time with Capt. Luis for a lagoon adventure and cookout. We were able to catch barracuda and spear lobster for lunch, and we spent some time swimming around the coral reef- I was thrilled! After lunch we went in search of manatees, which also pleased me greatly. We also waited out a rain storm by tying up to the mangroves in the boat. The only thing lacking from this fishing trip was the fishing itself. The website posts all sorts of pictures of exotic fish being caught and fishing was probably only 20% of our actual full-day adventure. My husband was particularly disappointed that we didn’t spend more time fishing… perhaps we could have had the cookout later in the afternoon (when it was forecasted to rain) to allow for fishing for more diverse species in deeper water while it was sunny out. Or perhaps the live bait could have been caught the day prior so we didn’t have to spend time looking for them. 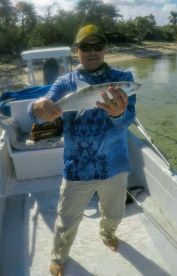 Or maybe the itinerary wasn’t properly explained to us up front as we did not know that we needed to specify that we wanted to catch more fish for the sport of it. We looked for snapper but couldn’t find them- nobody’s fault. I was delightfully surprised by the wildlife and coral viewing but it was supposed to be a fishing trip after all. Maybe the captain changed the itinerary on the fly due to the afternoon lightning storm… hard to say. We had fun, but the fishing portion left us wanting. For the price we paid, we’ve gone on fishing trips and caught dozens of fish each, and on this trip I think we each caught two fish over the course of an hour… we would have happily sacrificed other activities to spend some of the other ~6 hours fishing. NIce day to be on the water. 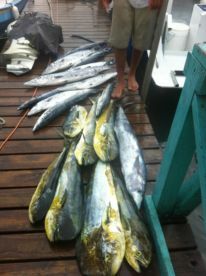 Went out got some sardines for bait and headed to the reef. 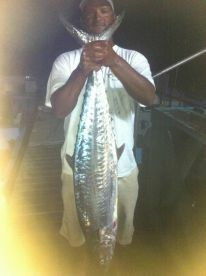 Caught really nice cuda’s, a few yellow tail snappers, a couple of little mackerel and a few other fish. We didn’t hit a home run but still a pleasant experience. I have fished with these guys before and will fish with them again. Coming back in July and will do a Deep Sea trip with them.